Don’t be surprised if you find yourself suddenly drawn to the “G” By Guess store in your local mall or shopping center. 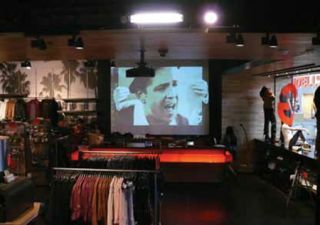 The fashion brand recently partnered with Pro-Motion Technology Group to install projectors that would transform its stores’ atmosphere. Throughout many “G” By Guess locations, Casio projectors have been mounted onto ceilings, projecting fashion images and music videos on the wall behind the cash registers. As the fashion and retail industries embrace technology innovation, “G” By Guess stores are poised to stay a step ahead. Founded in 2007 by the Marciano brothers (of Guess fame), the store sought to upgrade and showcase their existing visual technology to further enhance the store’s overall design. “G” By Guess chose Pro-Motion Technology Group for its leadership in integrated technology and commercial digital solutions. To date, “G” By Guess has installed more than 100 projectors in stores nationwide, including Casio’s Pro XJ-H1700. “Our company spent a lot of time researching the best projection technology for “G” By Guess and found that Casio’s projectors are unmatched in terms of their long lifespan, lightweight design, and overall total cost of ownership,” said Chris Thomas, project manager at Pro-Motion Technology Group. Casio projectors were selected because of the LampFree technology and Laser/LED hybrid lighting source. Pro-Motion Technology Group and “G” By Guess chose Casio’s projectors specifically because of the LampFree technology and state-of-the-art Laser and LED hybrid light source. Casio projectors provide users with a 20,000 hour estimated lifespan, eliminating the need for expensive projection lamps that often need replacement and can cost almost as much as the original projector unit over one year. “We recommended Casio’s Pro projectors for ‘G’ By Guess, and they have been well worth the investment,” Thomas said. Each store location can run video feed up to 12 to 24 hours per day, they and can shut the units down easily without worrying about additional setup time. When the power is turned back on the next day, the projectors retain memory of the predetermined settings and cut down on calibration time. Since the projectors use laser and LEDs, it only takes eight seconds from power on to reach full brightness. “I’ve heard nothing but positive feedback from ‘G’ By Guess’ store employees since we began installing the Casio projectors. We can see the difference in terms of brightness and clarity,” Thomas said. In addition to Casio projectors, Pro-Motion Technology Group also installed JBL 5-inch Surface Speakers, SoundTube RSi 10-inch subwoofers, a Crown CTS powered amplifier, and an entire audio rack in the back of the stores. Amirah Mercer is the digital editor for SCN and Residential Systems.